Haystack Rock is one of Oregon’s most recognizable landmarks, home to colorful tidepools and diverse bird life. It rises 235 feet from the edge of the shoreline. At low tide, you can walk right up to it and find colorful sea stars and other fascinating tidepool creatures in its intertidal area. Puffins can be observed on Haystack Rock from early spring to mid-summer, offering the most accessible viewing of Tufted Puffins in the Northwest. Many other varieties of birds can also be seen, making it a great bird watching location year-round. It’s part of the Oregon Coast’s geological history, formed millions of years ago by lava flows that created many of the dramatic capes and headlands on the Oregon Coast. Haystack Rock is part of the Oregon Islands National Wildlife Refuge and is a State protected marine environment. Haystack Rock in Cannon Beach is one of the most recognizable and popular attractions on the Oregon coast. Its intertidal area is one of Oregon's seven Marine Gardens, a designation indicating its status as a protected area. Above the high tide line, Haystack Rock is protected as part of the Oregon Islands National Wildlife Refuge, providing habitat and viewing of a wide range of seabirds including the most accessible colony of Tufted Puffins in the Northwest. Haystack Rock's tidepools are home to many intertidal animals, including sea stars, anemone, crabs, chitons, limpets and nudibranchs. The most colorful and visible creatures are the sea stars that are exposed at low tide and the large green anemones just below the water surface. 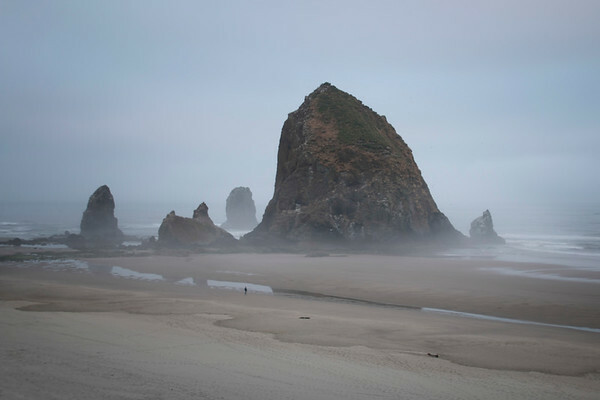 Its protected status requires that no creature or material be removed from within 300 yards of Haystack Rock and climbing above the barnacle line is strictly prohibited to avoid disturbing marine life and nesting birds. Visitors are encouraged to responsibly explore this exceptional natural area, walking only on sand and bare rock to avoid destroying the sea life that can take years to recover and preserving this outstanding natural area for all to enjoy. Fantastic moody seascape, great atmosphere! Beautiful shot. Like the way you caught someone on the beach. Gives great perspective to the overall scene.